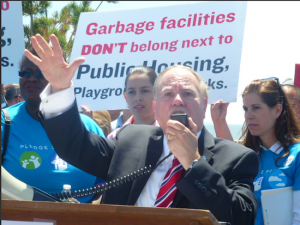 Assemblymember Bill Colton (left) led a litter sweep in Bensonhurst in August. Now, he wants the city to go after dog owners who don’t clean up after their pets. One local lawmaker is calling on the New York City Department of Transportation to resume its policy of putting up street signs to remind pet owners to clean up their pooches’ poop. Assemblymember Bill Colton (D-Gravesend-Bensonhurst) said a number of years ago, the Department of Transportation (DOT) installed signs to warn pedestrians to pick up after their dogs and that if they did not, they would receive a fine. The policy was discontinued a few years ago, according to Colton, who said it was likely due to budget cuts. Colton has sent a letter to the DOT requesting that the signs be put back up and that the city’s Pooper Scooper Law be fully enforced again. Dog owners who do not pick up after their pets cause health and sanitation issues that hinder the quality of life for the city’s residents, he said. Even more alarmingly, children playing on the streets and sidewalks throughout the city are often exposed to dog feces, he said. “It’s important that we protect the quality of life in our neighborhoods. It’s irresponsible and negligent for dog owners to not pick up after their pets, because of the serious health and sanitation problems that arise from not cleaning up after your dog. The streets signs the city used to install help reminded people that they have a legal responsibility to clean up after their dogs,” Colton said in a statement. The city does enforce the Pooper Scooper Law, but a city agent has to witness the violation taking place in order to issue a summons, according to the city’s website. DOT eliminated a program for non-essential signs, such “No Dumping,” “Curb Your Dog” and “No Littering” in 2003 because the proliferation of these signs diminished the effectiveness of priority signage, such as those for speed limits, turn restrictions, and school zones, an agency spokesman wrote in an email to the Brooklyn Eagle. But the city still takes the issue of dog poop seriously, officials said. The Department of Health & Mental Hygiene investigates reports of property or animal owners who fail to clean up unsanitary conditions or odors due to animal waste in backyards, private lots and other private areas. The Department of Sanitation investigates reports of property or animal owners who fail to clean up unsanitary conditions or odors due to animal waste in public areas.